StatoilHydro has reported that new seismic data from the Utsira formation in the North Sea indicate that the carbon dioxide being pumped into it is not leaking out, but is spreading through the structure as expected. Thirteen years have passed since StatoilHydro and the Sleipner gas field partners ExxonMobil and Total decided to capture carbon dioxide and store it beneath the seabed. The reason for the decision was the carbon dioxide emission fee introduced by Norwegian authorities in 1993, which made it more profitable to capture and store the carbon dioxide than to pay the emission fee. StatoilHydro extracts 2,600 tonnes of the greenhouse gas from Sleipner West production for storage 1,000 metres beneath the seabed, rather than releasing it to the air. 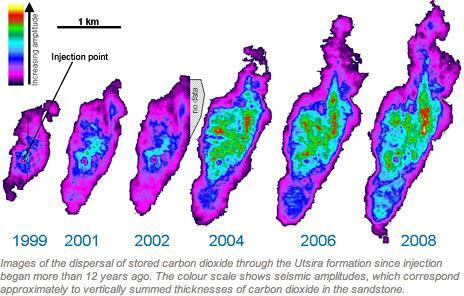 More than 10 million tonnes of carbon dioxide have been injected into the Utsira sandstone formation since the autumn of 1996. StatoilHydro conducts extensive monitoring and control of the carbon dioxide in the sub-surface store, and collects four-dimensional seismic data every other year. Intended to identify the way the gas is behaving in the formation, this information from the 2008 survey has now been analysed. The seven geophysical measurements conducted to date show a stable trend, with the carbon dioxide spreading upwards from the injection site and slowly through the rock. It is maintaining the same dispersion speed as in 2006, and the monitoring has established that the gas remains in the formation with no leakage to the surface. The injected carbon dioxide currently covers about 3 sq kms of the roughly 26,000 sq kms available in Utsira. Researchers from StatoilHydro and its partners - Sintef, the British Geological Survey and the Dutch Institute of Applied Geoscience - have created mathematical simulation models. These are supplemented with forecasts for long-term storage of the greenhouse gas, which are based on experience and knowledge of seismic surveys and geophysical reservoir monitoring. Carbon capture and storage (CCS) could provide one of several important measures for reaching the goal of reducing greenhouse gas emissions. The significance of such action is indicated by forecasts from the International Energy Agency (IEA) that world energy demand will grow by 50% up to 2030 and be 80% met from fossil sources. StatoilHydro is working purposefully to reduce carbon emissions from its operations, and CCS plays a significant role in these efforts. The European Union aims to reduce its carbon emissions by 20% up to 2020, and reached agreement in December on a climate and energy package. This includes a framework for CCS, with a directive on the way EU members and Norway will regulate licences to ensure reliable carbon storage.